Organised by UT SEMIDE, the European project HYDROUSA – which aims to provide innovative solutions for Mediterranean islands in terms of water/wastewater treatment and management through closing water loops and boosting agricultural and energy profiles – held its 2nd General Meeting on 31st January- 1st February 2019 in Nice at the Centre Universitaire Méditerranéen (C.U.M). The meeting brought together the project consortium, composed of 27 partners, together with direct stakeholders coming from French and other European Islands to discuss the implementation progress of the project. Water management in Mediterranean islands is currently fragmented and there are several barriers, which need to be overcome in order to close water loops and contribute towards the environmental and economic development of these regions. Mediterranean islands, in particular, face significant challenges in terms of water management and conservation. Water reserves are scarce, while the high touristic activities during the summer months stress the limited water reserves. To overcome these challenges, the Horizon 2020-funded project HYDROUSA, which started on 1st July 2018 for a period of 54 months with a total budget of 12 Million euros, aims to provide innovative solutions for Mediterranean islands in terms of water/wastewater treatment and management through closing their water loops and boosting agricultural and energy profiles. HYDROUSA goes beyond the current water and wastewater management practices by adopting innovative, nature-based water management solutions for different types of water characterised by low energy footprint. These technologies will be demonstrated in six demonstration sites at full scale in three Mediterranean islands (Lesvos, Mykonos and Tinos). 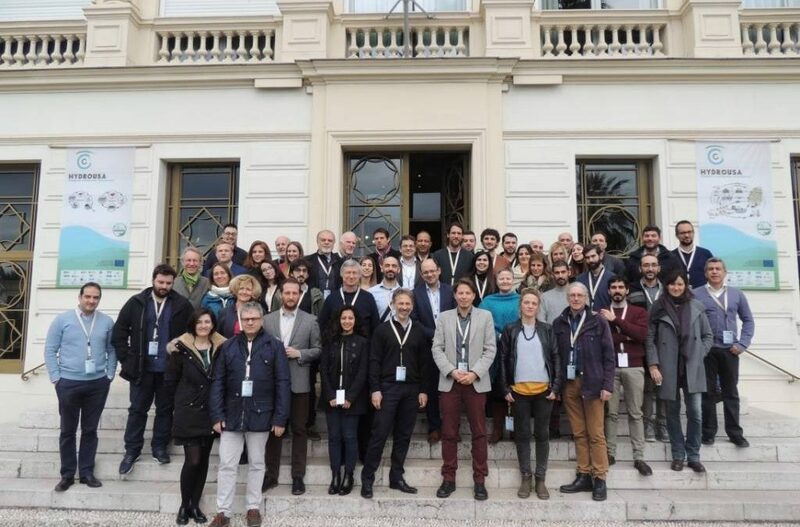 The project HYDROUSA held its 2nd General meeting from 31st January to 1st February 2019 in Nice at the Centre Universitaire Méditerranéen (C.U.M) organised by the French partner UT SEMIDE which is part of the consortium. During the general meeting, the consortium of the HYDROUSA project – which consists of 27 highly competent organisations involved in water management, agricultural activities, ICT and, business/marketing, dissemination/ communication – presented and discussed the status of the project after the first 6 months and prepare the next phases. The meeting was also attended by two Advisory Board members, Prof Michael Scoullos, Chair of GWP-Med and MIO-ECSDE (Greece), and Florent Chazarenc, Research Director at IRSTEA (France). They both appreciated the overall dynamic of the project, the positive energy of the 60 participants and they gave recommendations for future activities. Furthermore, the project organized a stakeholder’s session during the afternoon of 1st February to collaborate with stakeholders from the replicability sites coming from Porquerolles and Zlarin Islands (Croatia) represented by SMILO network (Sustainable Islands network launched by Conservatoire du Littoral) and Elba Island (Italy). Furthermore, academics from Polytech –Cote d’Azur University joined the session. Finally, transferability of HYDROUSA solutions will be demonstrated in Mediterranean and water stressed places in 25 early adopter cases in coastal areas and islands in Italy, Spain, Cyprus, France, Egypt, Croatia, Israel, Turkey, Palestine, Lebanon, Morocco and Tunisia and at least 6 water-stressed rural or peri-urban areas from Bulgaria, China, UAE, Australia, Mexico, Chile, Malaysia and Argentina. Institutional pathways, policy drivers, barriers and opportunities for the market deployment of the project technologies and services and for the use of the recovered resources will be detected, analysed and elaborated on. *** HYDROUSA has received funding from the European Union’s Horizon 2020 research and innovation program under grant agreement No. 776643. TECHSOUP: POWER UP YOUR SOCIAL IMPACT! IMPACT HUB ATHENS CO-FOUNDER RECEIVES SOCIAL INNOVATION & CHANGE AWARD IN WASHINGTON D.C.